You should know that as this sandwich was being prepared, I foolishly left the butter on the counter and turned my back. In a heartbeat, Gracie leaped up and snatched the golden cube; in a second heartbeat I commanded her to drop it. She did. After inspecting the butter to find only the tiniest of tooth marks, I rinsed it off and used it anyway. I am passionate about my midnight snacks. Well, I'm a firm believer in home-cooked meals at all times of day. And because my body clock works on a delayed sleep schedule, my daytime meals are very light, and I'm up for many hours after dinner. So a warm, satisfying bite to eat around midnight is a necessity for me. Lately my obsession has been a grilled cheese sandwich. Now, I've been churning out these classics for decades, and usually my goal is to elevate the ingredients. Wheat bread loaded with nuts and seeds or sourdough, tangy and crusty. Sharp cheddar or smooth Monterey Jack, stringy mozzarella or pricey provolone. 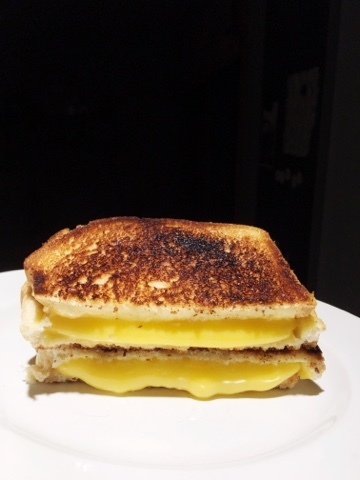 But lately, I'm all about the low-brow basics of buttermilk white bread and American cheese. So salty and processed and utterly unhealthy. But when I cook one of these babies up, savor every heavenly bite, and lick every last buttery crumb from my fingers, I have no regrets about my midnight snack. My reading tastes run deep and wide, but so far this year, eight of the nine books I've read are children's books. But why do I read so many children's books? Fair question. But let's back up another step and ask, what makes a book a children's book? According to my hero, Madeleine L"Engle, a children's book is any book that appeals to children. Well. I happen to know that is false. Because when I was quite an innocent young thing, I found a book on my mother's private bookshelf that began with a detailed description of a row of tiny buttons on a woman's nightgown and how they were oh, so slowly unbuttoned, one by one, and I knew for a certain fact that this book was not meant for me but boy, oh boy, how those words lured me in. So, sorry dear Madeline, but we must toss your definition aside. I submit that a children's book is one that tells something of what it is like to be a child. And this is exactly why I love to read children's books. They remind me of who I used to be. They show me how far I have come. They make me feel more complete and alive. 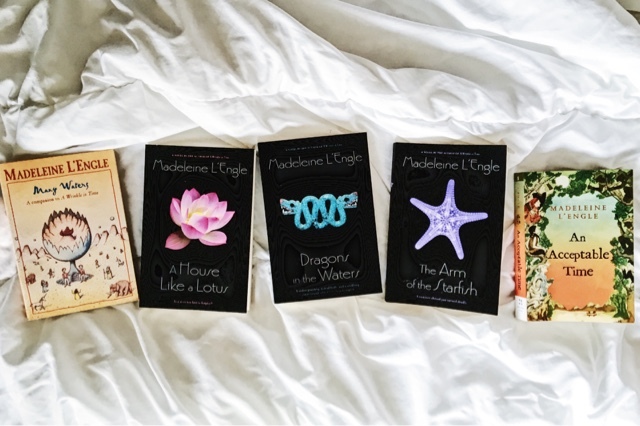 Not only do these five books remind me what it's like to be a teen caught up in the first throes of self-discovery, but they also deliver on tense and intricate plot lines, cleverly crafted characters, and gorgeous settings around the world. I recommend them for humans of all ages. Now that Meg Murry and her much younger brother, Charles Wallace, have had three lovely time-travel adventures to themselves, their in-between twin brothers now get a turn. The pale-skinned teens fiddle with their scientist father's newfangled computer and inadvertently send themselves to a desert of unknown time or place. Sunburns kick off a crazy set of coincidences that ultimately reveal their unique place in history, and an ending is just oh, so satisfying. Let's skip ahead a generation. Meg has married high school hottie and fellow time traveler, Calvin, and they now have a brood of children running around their home-sweet-scientific-research-post on a remote island off Portugal. When American college boy, Adam, hops the pond to do research with Calvin for the summer, he gets caught up in an international ring of bad guys (and one very bad girl) who want to steal Calvin's research for their own deliciously evil purposes. Also involves swimming with dolphins and riding horses on wild beaches. This time, Meg and Calvin's eldest daughter, Poly, plays the lead as she and her father innocently embark on a Caribbean cruise intending to do some scientific research, but get caught up in an intrigue involving an orphan boy, his just-crawled-out-of-the-woodwork uncle, a tribe of native people mostly untouched by modern society, murder, intrigue, kidnapping, and a missing portrait of Simon Bolivar. The ending is surprising and satisfying. As characters from L'Engles' other novels pop up here and there in this and other stories, the feeling is one of huge cocktail party where you never know who you might meet...or meet again. Awkward little Poly has come mostly mature Polly, who at age seventeen is taking a solo trip to Greece. In the first half of the book, she sightsees in Athens with a flirtatious American beau; in the second half, she works as a gofer at a literary conference in a secluded village and lives in the world of thoughtful adults. Throughout the adventure, she flashes back and tries to make sense of confusing aspects of growing up. After her adventures in Greece, Polly has been whisked up to New England to spend the year homeschooling with her brilliant scientist grandparents. Not only does this lead to re-encounters with the American beau from Athens, but she also stumbles upon a time portal, apparently similar to the one her...ummm, let's see, he would be her uncle Charles Wallace used in A Swiftly Tilting Planet. Hijinx with Native Americans ensue - some friendly, some not - and Polly, like every L'Engle heroine, must make the best of some tough choices.